Hi guys, so today I wanted to branch out to general blogging and talk a bit about value, and the importance of it, how you can add value to your blog and what readers expect. Value is the worth that your blog has, I don’t mean monetary worth, I mean the importance your blog content holds for readers. If your blog is valued, it means people find something about your content, style or personality (In your posts) that they respect or look up to. 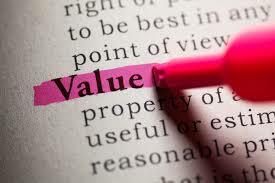 By giving something value, one is stamping a seal of approval or agreement. So if I say I value Dxb Blog, I see it as a worthy blog to read. It’s basically worth my time? People who read blogs or things online tend to base their decision (Whether to read it or not) on is it worth my time? Or have a I got the time? By adding different types of media, such as videos and pictures to your posts, you are giving your readers more, even if they don’t have a lot of time, watching a 5 minute video or browsing through images can sometimes tell more than a 1000 word post! Also, why not customise your media? So make your images on photoshop or record the videos yourself and give your live commentary? Relating to the travel industry; be in your setting snaps, record a video of a certain place with your running commentary, explaining whats what and who’s who!? Personalisation is always attractive, because it’s what makes your stand out, it’s your own touch! So you might be thinking, well then they’ll be distracted from my blog? Wrong. Readers will see your blog as a reference point and be more likely to re-visit it BECAUSE of a reference you gave or link you shared. This also helps your SEO and keeps your readers interested. This might seem a bit contradictory to the first int about media over words but again, personalisation… Giving an article a story gives meaning, as well as value to your readers. Instead of just telling them about your top 10 restaurants in a city, why not tell them about a time you visited one of those restaurants? Or Instead of sharing tips about backpacking, why not share a route you have personally done? Whether its list building, competitions or interactive posts, get your readers involved and make them feel part of the blog family! Whether its just you or a team of bloggers, designers and marketing specialists behind the blog, get your readers on board the train! If you are list building and sending you readers regular updates, make sure they’re not all promotional or asking for something FROM the readers, give them something in return now and again! This point is important in a lot of different aspecting of content but to add value, you need to know where you’re headed and what you are adding value to. take the time to plan and carefully think about what you want to achieve for each post or the content you are creating! This will not only add value for your readers but also add value for your business goals.